I don't know what it is about fruit leathers, but I was absolutely obsessed with them when I was a kid, and I know for a fact that I was not the only one. They had gone off my radar for a while, but a conversation with my friend surrounding childhood snacks reminded me of just how much I used to love them. It was my granny who always used to buy us ones from the store, as my mom insisted that they were processed and full of sugar, which was most probably correct. 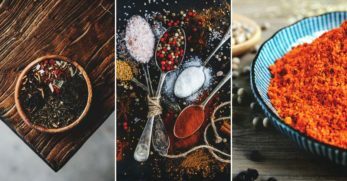 There is, however, a whole range of fantastic recipes out there for making your own fruit leathers, with creative flavor ideas and ingredients you can keep track of. 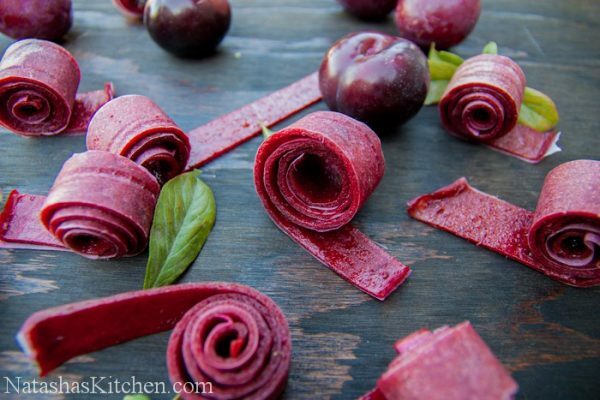 They aren't just for kids either, there are some more sophisticated flavor combinations out there, so I think I might just be hopping back onto the fruit leather bandwagon. We'll start simple with a classic and much-loved strawberry fruit leather. In my opinion, you can never really go wrong with strawberry flavored things. If there is a packet of multicolored sweets, I will always pick out all the red ones, much to the annoyance of my family. It is convenient that you can use frozen berries, as they're not the most readily available at all times of the year. Not only would these be delicious, but also a very cunning way of sneaking some beets into your kids' mouths with them being none the wiser. 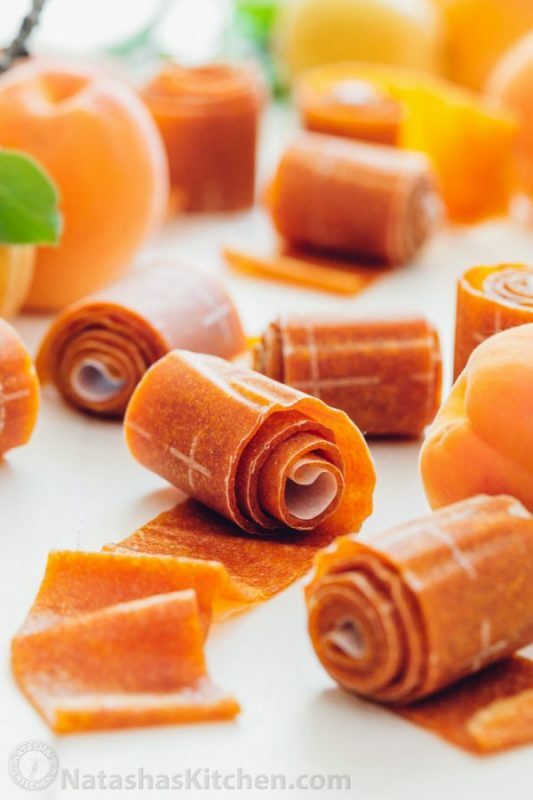 This apricot fruit leather literally has two ingredients. Two. It might not be the healthiest with the added sugar, but you could adjust that dependant on the amount you want to use, or keep it sweet and reserve it for treat time. I love dried apricots as a snack, so I really like the sound of this, and with no extra flavors added, that of the apricot would be the main focus. The suggestion to dry out the fruit leather in the sunshine is a lovely one, and something I would definitely like to try. I always put banana and blueberries on my porridge in the mornings, so this flavor combination makes me think of that, and I would probably have it as a little late morning snack. 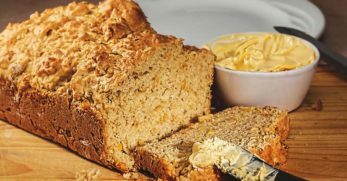 Because ripe bananas are sweet, this recipe doesn't require any added sugar, so the only ingredients are the fruit which is amazing. It's as healthy as eating a banana and a handful of blueberries, but far more fun, and I know for a fact which one I would rather have. 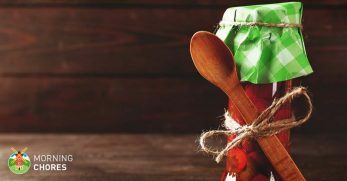 This recipe can be used with any fruit substituted in, but peach is used in the example, and I love the flavor of peach so I reckon I would go for that. 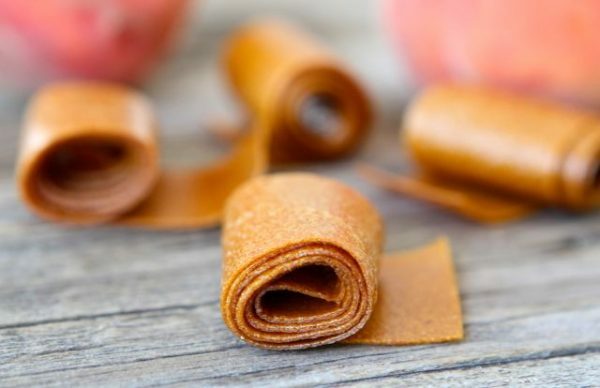 I can imagine this peach fruit leather being just the fruity pick me up that you might need on a dreary day, and I love the bright orange color. 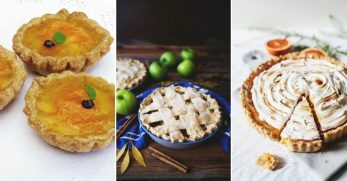 The fact that honey or maple syrup is suggested as a sweeter is much more attractive to me than plain sugar, and would add a much more delicate taste to the fruit leather as opposed to just pure sweetness. 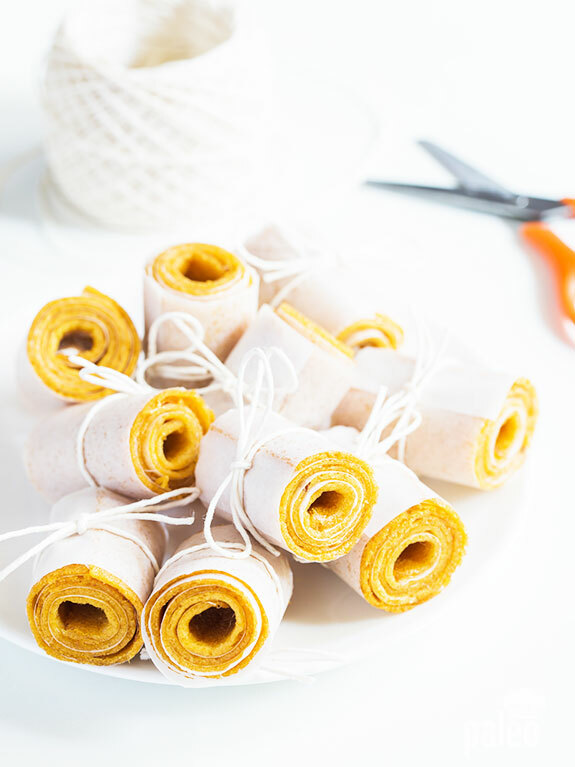 Now, this pumpkin apple fruit leather sounds like the loveliest little autumnal treat. 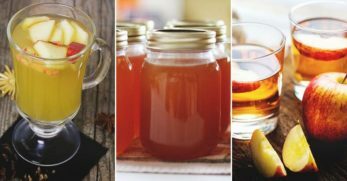 I love the combination of ingredients and flavors and think the maple syrup is a nice addition both as a sweetener and as an extra flavor. I think if I were to try this out I might even experiment with adding a bit of cinnamon to bring out that fall-like feeling even more. Especially with the pumpkin pie sauce, I think this would taste like a lovely big slice of pie flattened out into a fruit leather, and I personally am desperate to give it a go. 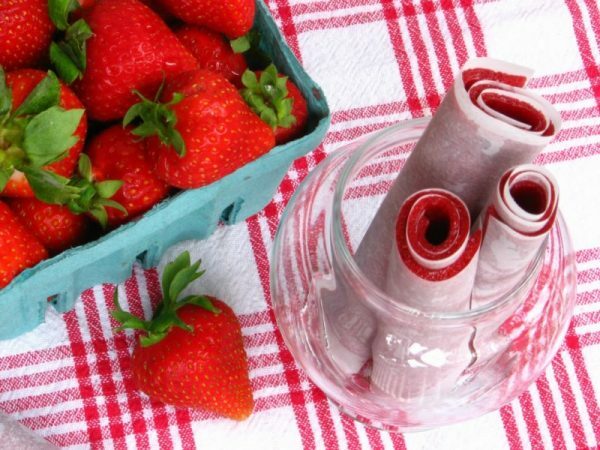 This is like a grown-up version of a regular strawberry fruit leather, and I think it is a genius idea. 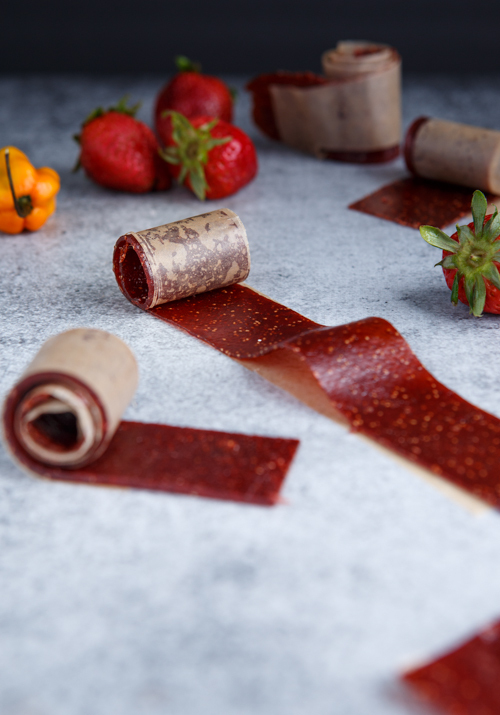 It can be challenging to balance sweet and spicy, but I think this spicy strawberry fruit leather recipe looks like it does so just perfectly. 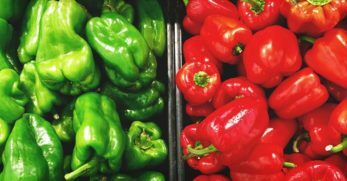 You could adapt the amount of habanero you use to suit your own preference, or even entirely remove it if you would instead just use this as a strawberry recipe. 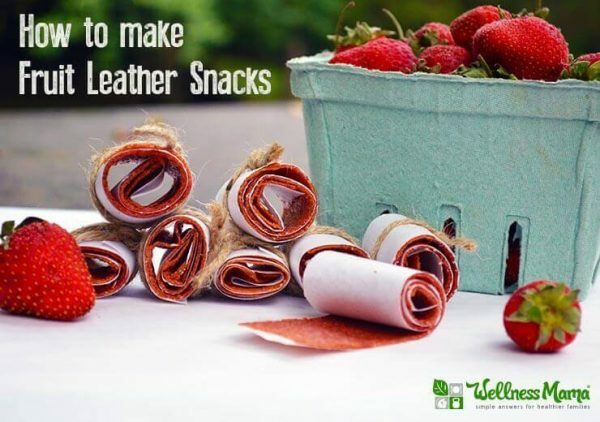 I would love to see what other sweet flavors of fruit leather you could add a little kick to. I've never seen a fruit leather quite as pretty as this peach raspberry one, and I am so into it. It is such a cool idea to leave the two mixtures separate and then marble them together, creating this effect instead of an orangey colored combination of the two fruits. Gorgeous looks aside, peach and raspberry is a delicious flavor combination, both fruits are strong in flavor themselves but also work so well with one another. 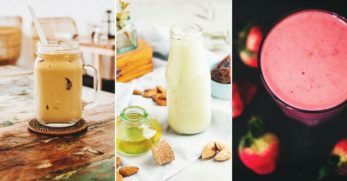 I will definitely use this technique of mixing the two fruits with other flavor combinations too. 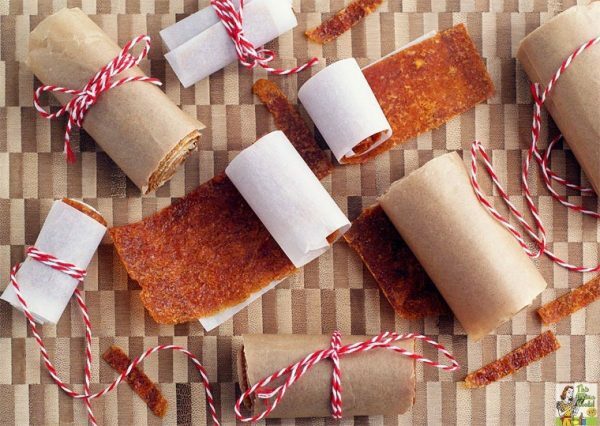 What better time of year to try out this spiced orange fruit leather recipe than during the festive season. Of course, you could make this whenever you want to, but there is something about spiced orange flavors that just screams Christmas to me. These are a great way of providing your kids with a sweet treat throughout the chocolate filled holiday season without worrying about their teeth falling out. There are no added sugars, just yummy warming spices and a whole lot of orange goodness. 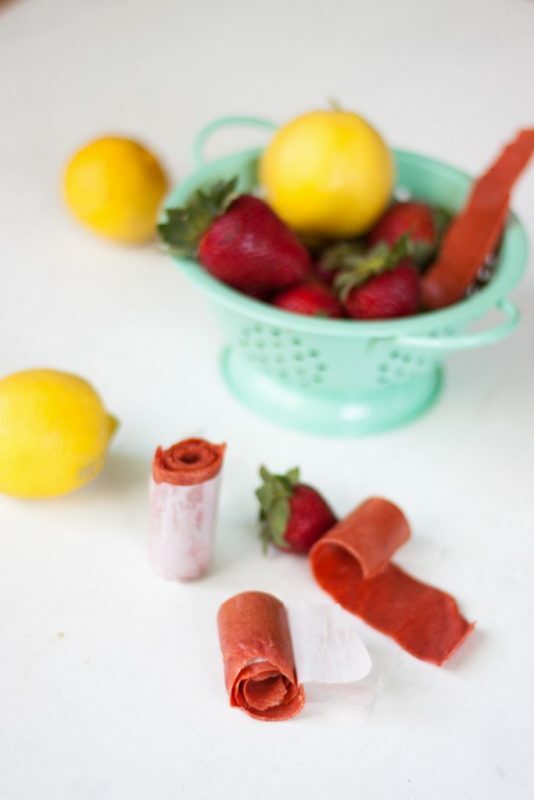 This strawberry lemonade fruit leather sounds like such a delicious treat and, being inspired by one of my favorite drinks, and I am ready to make myself a batch right this second. Although you might expect this to be full of sugar with reference to soda, it is not at all; all that sweetness comes straight from the strawberries with a little help from some honey. 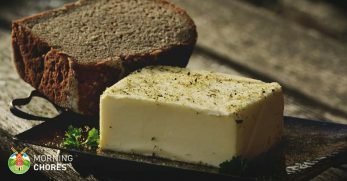 The recipe is straightforward to follow, all you really need is a food processor, and you're good to go. I know that I would have devoured this as a kid, and doubt that many kids wouldn't. Plums aren't a fruit that I buy often, and I am not sure why because I really do like the taste of them. 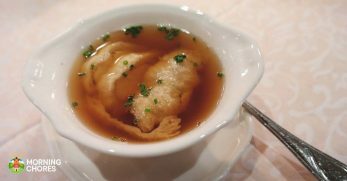 It doesn't seem to be a flavor that is used to much, which is why I think this recipe is a nice option for something a little different. I love the deep purple color of this plum fruit leather, and sweet plum is a nice festive flavor, without being too seasonally restrictive. The plums take a bit of preparation before you can go ahead and blend them up, but it's not a lot of work at all, especially when you consider the sweet treat you will get at the end. This rainbow fruit leather is so cool, and if I love it now as an adult, then I can't imagine how crazy kids would go for it. 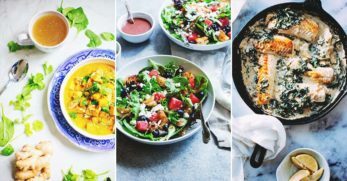 A really nice variety of fruits have been used in this recipe, but you could definitely use it as inspiration and swap out flavors to include all your favorites. There isn't too much sugar added to the fruit, and the lemon juice will give it a nice citrus flavor throughout. These are just so much fun and are incredibly easy to make. I can imagine these going down so well, and your kid will be all the rage in the playground when they bring one of these out of their lunchbox. 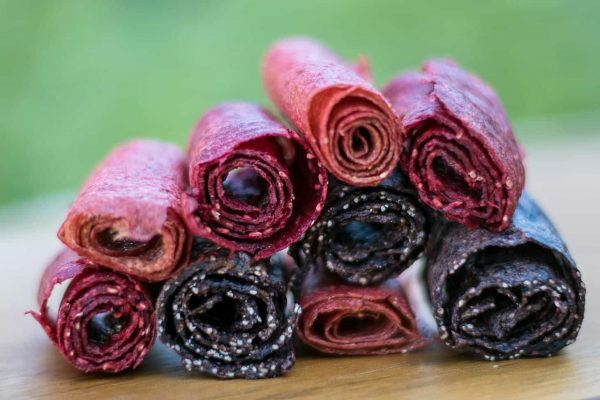 These straw-raspberry basil fruit leathers are so innovative, and I love just how different the idea is to the traditional fruit leather flavor. I would never have thought to add basil or any other herb for that matter, so I really do think it is genius. 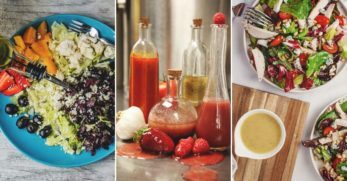 Strawberry and basil is a pretty well known and loved flavor combination, so this recipe is bound to be delicious. 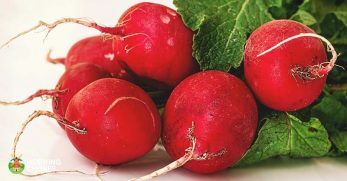 It has a fun, bright red color, and I can imagine that eating this as a sweet snack on a summer's day would be just delightful. 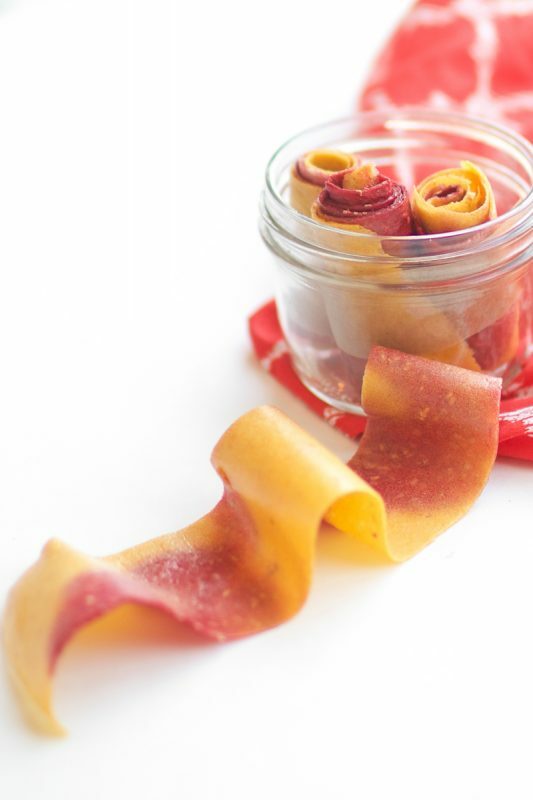 If you're looking for a punchy tropical snack to put a smile on the face of anyone who is eating it, look no further than this pineapple fruit leather recipe. Pineapple is one of my favorite fruits, but I definitely don't get to eat it enough because I never get round to finishing it before it goes bad. The addition of the orange and honey in this recipe will make the fruit leather so delicious and sweet. 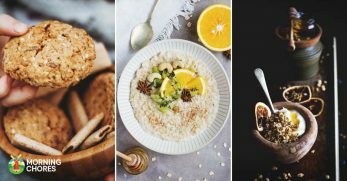 You can get yourself a sweetness fix by helping yourself to these without feeling like you are consuming a large percentage of your body weight in sugar. 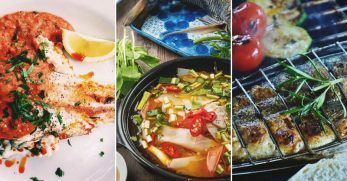 This recipe is a triple whammy, with three fantastic flavor ideas in one. I personally am really sold on the strawberry rhubarb fruit leather. Rhubarb is one of my dad's favorites, I have a love-hate relationship with it, but I do love it when combined with strawberry. It's effortless to grow yourself, we always have a forest-like rhubarb area in our vegetable patch in summer, so that is a big plus. 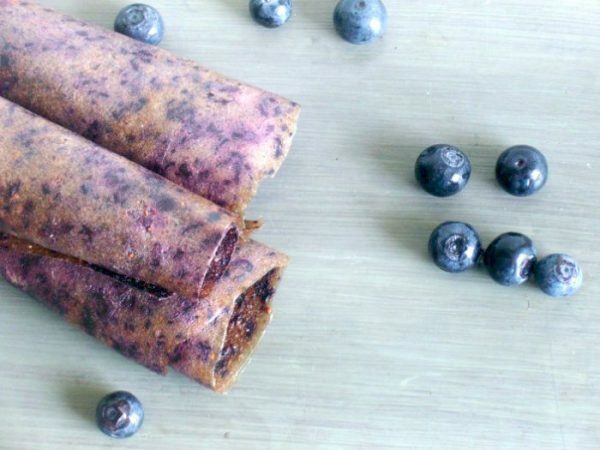 The blueberry chai banana recipe that is also mentioned sounds really good too and those chai seeds would give a fascinating texture to the fruit leather. 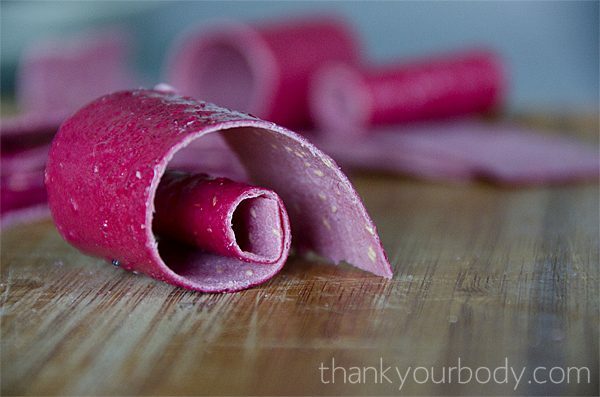 I love this yogurt fruit leather recipe because it is something a little bit different. 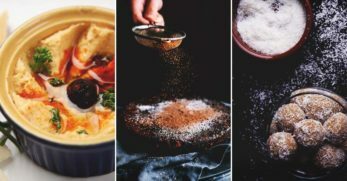 I haven't come across any other methods that use yogurt as a base instead of just pureed fruit, and I think it sounds delicious. Raspberries are always yummy and go well with yogurt, so I think they are definitely a good choice here, but I'm sure you could also experiment with different fruits and yogurt flavors. 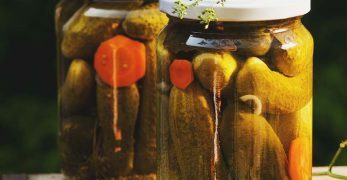 Because they don't only include fruit, they are most probably that little bit more filling than other fruit leathers, meaning that a batch should technically last you a bit longer. Potentially not though, considering how good they look. I absolutely love watermelon, especially chomping down on a huge, cold slice on a hot summer's day. One issue with it, however, is that it's difficult to harness its flavor, and anything watermelon flavored tends to taste extraordinarily artificial and overly sweet. 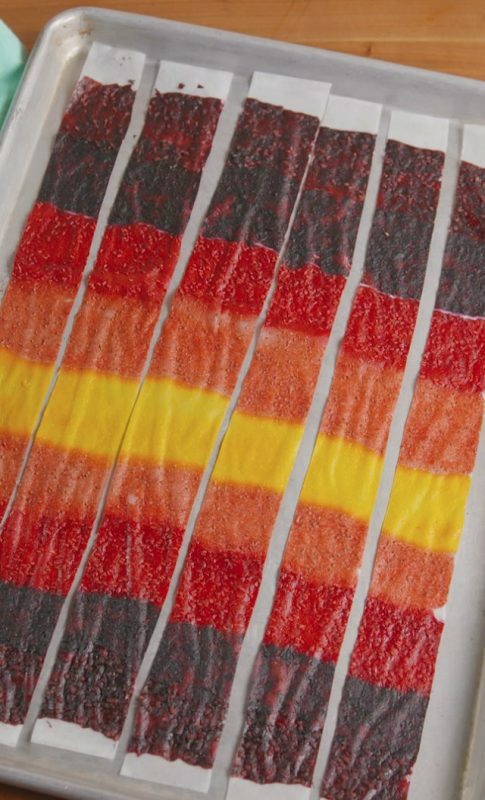 I am hoping that this watermelon fruit leather recipe fixes that, as watermelon is one of the only two ingredients used in it. 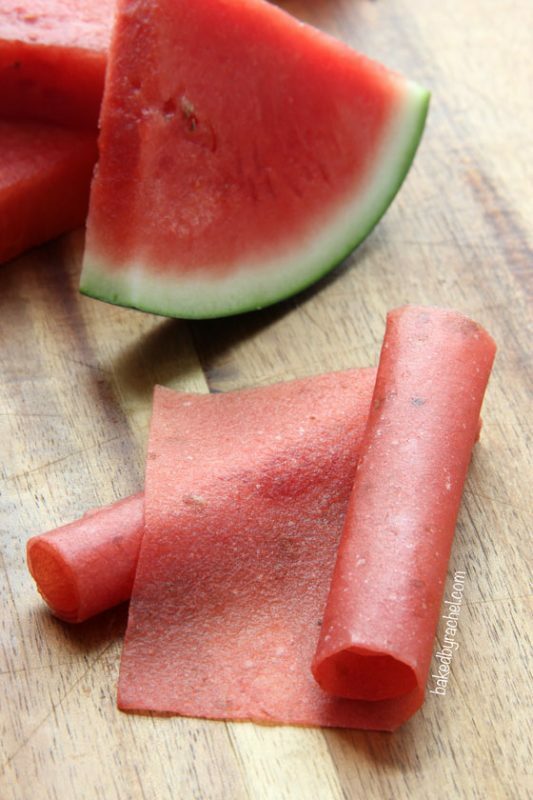 As much as adding sugar makes it a tad less healthy than some other fruit leather recipes, because watermelon is mostly made up of water I feel like the sugar is necessary here in boosting the flavor of the snack. 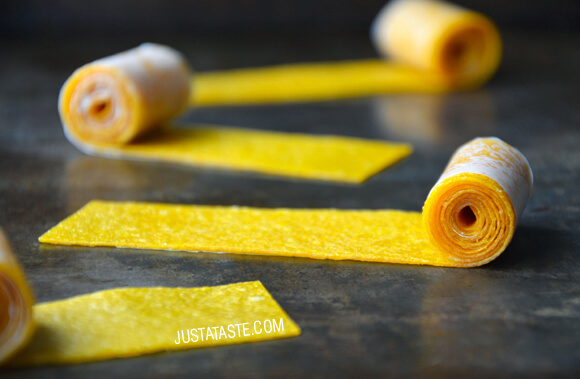 These mango fruit leathers are literally just made from mango, no added sugar, no frills, just pure mango loveliness. 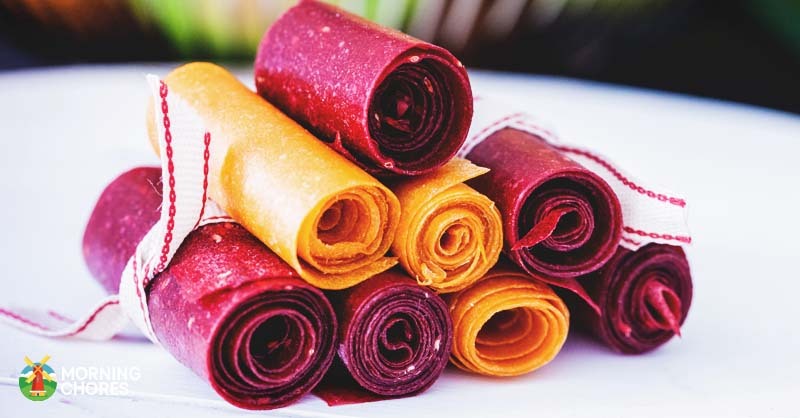 With that considered, these fruit leathers are just as healthy and delicious as biting into an actual mango, but even more fun and less juicy. 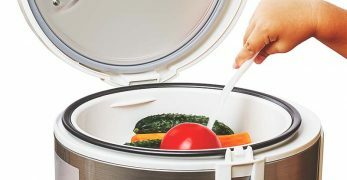 These would be great to give to young children so that they can enjoy the fantastic mango flavor and you can enjoy not having to clean the juice off every surface in your home. 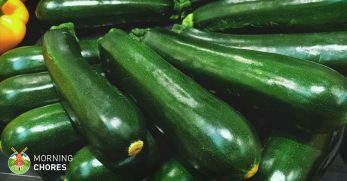 I must admit that I wasn't sure what to think of these when I first looked at the picture, as I don't find the color all too appealing. 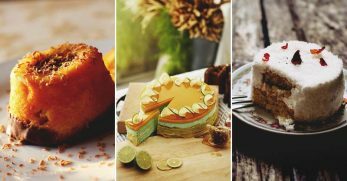 The combination of the flavors of citrus, kiwi, and pineapple, however, is effortless to look past the appearance for. 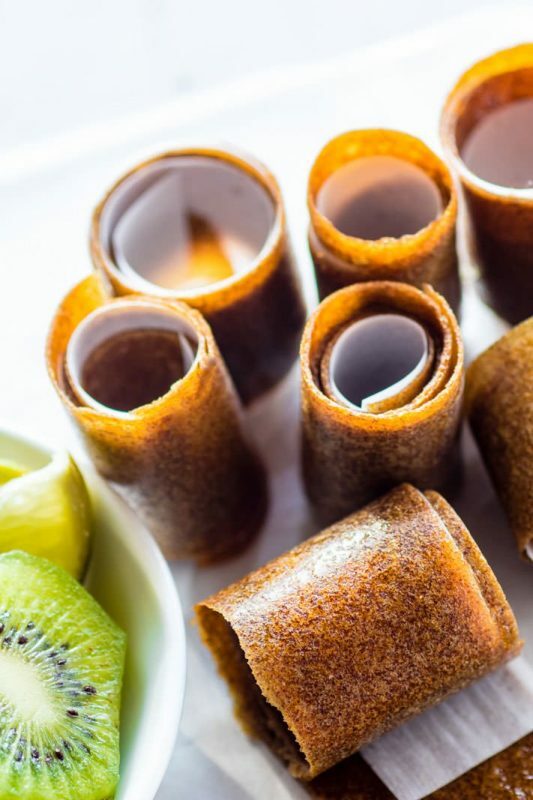 You can use coconut milk in this recipe, which I find really interesting, and even the thought of that along with all the tropical fruits is making me desperate to taste one of these fruit leathers. It's like a little rolled up and edible version of a tropical paradise. 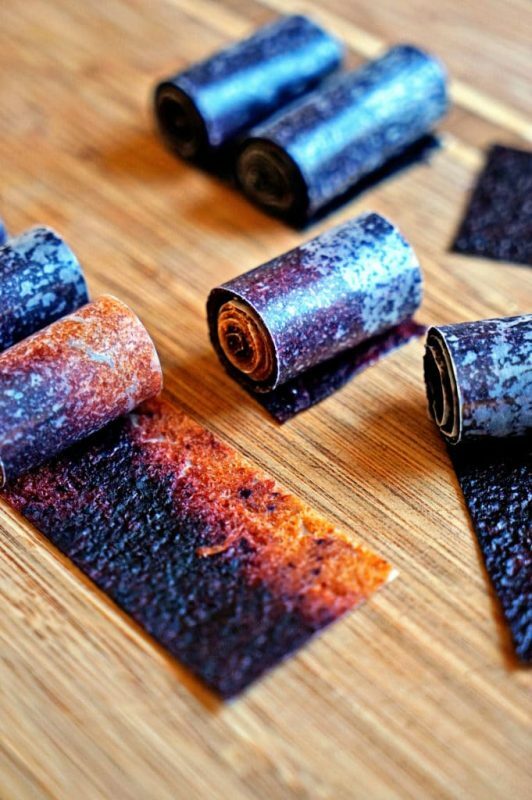 I know that the look of it doesn't really matter, but I can't help but be captivated by these nectarine blueberry fruit leathers. To me, they look like a sunset or a campfire against the night sky, and I think that is so lovely. 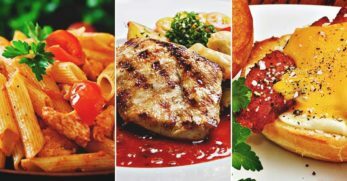 You could easily take this effect as inspiration and try it out with different flavors too. Even if they didn't look so pretty, however, I would still be drawn to them. I love nectarines, and I just wish they were more readily available throughout the year. Blueberries are so good for you, so you could know that by munching on one of these you were doing your body a favor. This sounds like a really sophisticated fruit leather, and my inner child would feel so relaxed snacking on such a grown-up flavor. 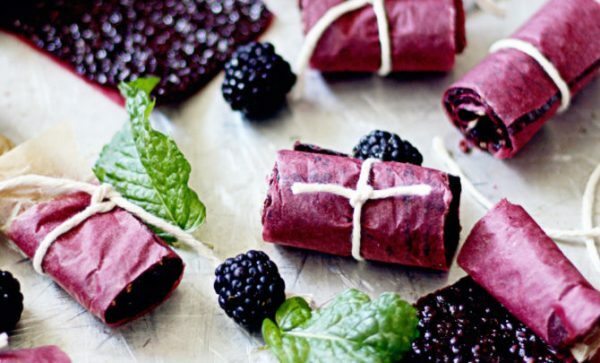 That's not to say that kids wouldn't enjoy these blackberry mint and lime fruit leathers too though, I think that most definitely would. 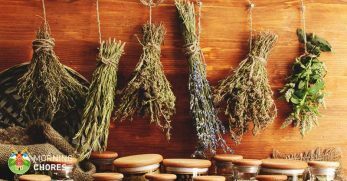 There is no added sugar so all those flavors would come through nice and strong, with only honey to give it a helping hand sweetness wise. The recipe looks incredibly simple for having three flavors, and I for one am definitely curious as to how it tastes. 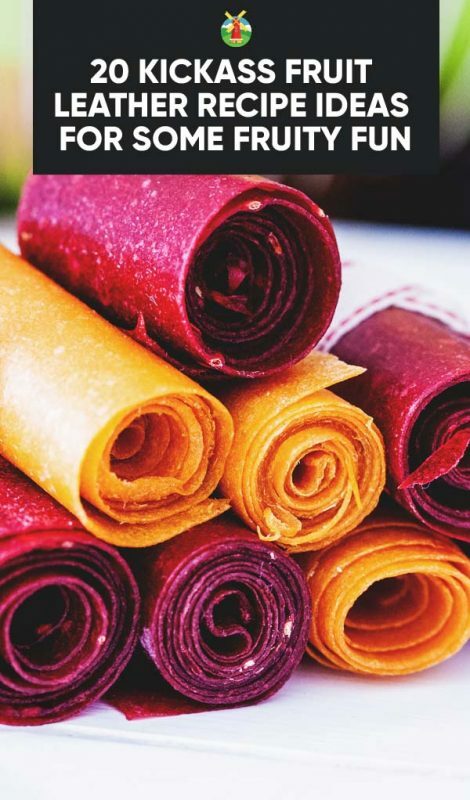 I had an absolute field day tracking down all these fruit leather recipe ideas and reminiscing over the hundreds of fruit leathers I must have consumed as a child. There really are far easier to make than I ever thought, even if they might take a long time to dry out. 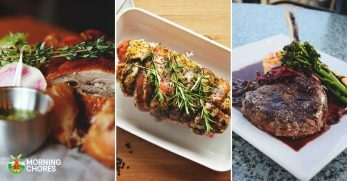 These are but a few examples of how creative you could be with the flavor combinations you choose to use. Since pineapple is one of my favorite fruits I think I would definitely have to try out one of the recipes with that in it, although the peach and raspberry one sounds delicious and looks so pretty. I am definitely going to have to try and mimic that kind of half and half effect of the blueberry nectarine recipe too. Were you as big of a fruit leather fan as I was when you were a kid? 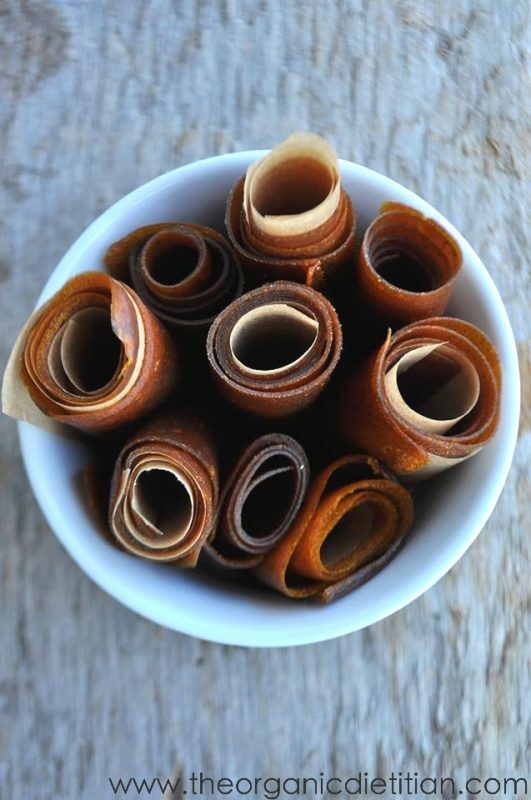 Do you think you'll be trying out some of the more adventurous flavor suggestions in your own fruit leather making?